Never let it be said that you cannot win great fortunes when playing poker, for over the decades there have been and will always continue to be some poker players that are at the top of their games and have won millions playing the games they love too! This section of this website is one in which I am going to be revealing you the top 10 poker players, based on their winnings to date, and as you are about to find out there have been and always will be some huge cash prizes up for grabs which these players do appear to have mastered the art of grabbing or should I say winning! When playing poker it is often the major poker tournaments that professional poker players will make a beeline to play rather than trying to earn their fortunes playing in cash ring poker games. 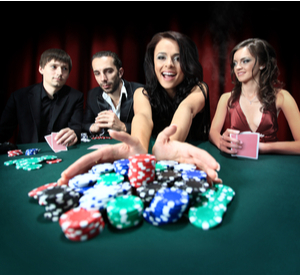 However, to please read on to find out whom those top 10 poker players to date are. With some amazing tournament wins to his name, which have amounted to tournament winnings of some $34,151,327 the number one poker player in the world currently is of course Daniel Negreanu. You need to keep in mind though that when playing in poker tournaments that have some mega prize pools available, it is possible for a relatively unknown poker player to be catapulted into the list of the top poker players in eh world thanks to a huge tournament pay-out, however having said that Daniel is a very, very good player and known what is required to win any poker tournament. In fact the biggest win he has had to date in his poker playing career was in the 2014 WSOP event in Las Vegas where he won the $1 Million No-Limit Hold’em Big One for One Drop and took home a huge $8,288,001 in prize money! The second top poker player in the world based on his international winnings that amount to a whopping $33,333,457 in prize money is Erik Seidel, and he is certainly a player that many other poker players admire the style of. As for how he has accumulated so much in winning, well he has won plenty of different tournaments played all over the world, and he is certainly a very seasons and travelled poker player for sure. His high valued poker tournament win to date was in 2011 that was in the Aussie Millions over in Melbourne and it was in the $250,000 Super High Roller event that he managed to bag a whopping $2,489,747! The number three top poker player who is one many people either love or that is of course Antonio Esfandiari but one thing you do have to admit about him, and that is he sure knows how to play a good game of poker! His tournament winners have so far amounted to $27,096,274, and I am of the mind they will continue to grow. Regarding his biggest poker tournament win to date you have to look back to 2012 in the WSOP Las Vegas event in which he entered the $1,000,000 No-Limit Hold’em the Big One for One Drop tournament and walked off with a massive $18,346,673 in winnings which is some achievement!! The $26,746,838 in poker tournament winnings that have been amassed by Fedor Holz has catapulted him into number four spot on this list of the top poker players in the world. As far as his most recent most noticeable achievement that was in 2016 in the WSOP $111,111 No-Limit Hold’em for One Drop tournament where he blew the opposition away and bagged some $4,981,775 in tournament winnings! You will of course of heard of the poker player Phil Ivey, for whilst he has amassed total poker tournament winnings of $23,466,348, he has been involved in many scandals recently too. However, like him or not he has certainly not only mastered the art of playing poker, but from his most recent scandals playing other casino card games to his advantage, by fair means or foul it would seem from the news reports! Regarding his biggest single tournament win to date that was back in 2014 in the Melbourne – Aussie Millions AUD$250K No-Limit Hold’em poker tournament when he took home with him a huge $3,573,600 in winnings from that poker tournament! Temper tantrums are what you will probably associate the next poker player on my list with and he is one that has managed to accumulate a grand total to date of some $21,461,350 playing in worldwide poker tournaments. That poker player is of course Phil Hellmuth Jr. and there is no doubt in my mind he is a poker player you have seen or heard of before. In 2012 he played in the WSOP in Las Vegas and it was in the $1,000,000 No-Limit Hold’em – The Big One for One Drop that he did manage to win a total of $2,645,333 from that one single tournament. It is John Juanda who is the seventh top poker player in the world as of the time of compiling this list and his personal poker tournament winnings are huge at some $23,418,600, and he amassed that great fortune playing in many different poker tournaments held all over the world. John Juanda did have his best run of luck to date very recently back in 2017 and it was in the Triton Super High Roller Series HKD 1,000,000 No Limit Hold’em poker tournament that he really did manage to play up to his very best form. It was in that tournament he earned his right to take home with him, thanks in no small part to his poker playing prowess a whopping $2,913,352 in poker tournament winnings! Sam Trickett has earned himself quite a following in the poker playing world and many people do enjoy watching him play as he plays with complete confidence and does strike fear into the hearts of the opponents that are sat around any poker table playing against him. He is currently the eighth top poker player in the world, having rightly earned his position on this listing by accumulating in poker tournament winnings to date a huge $20,766,881. If you are interested in learning just which poker tournament to date that Sam Trickett did have the biggest payday in, well that was back in 2012 when he entered the WSOP Las Vegas event that being the $1,000,000 No-Limit Hold’em – The Big One for One Drop and that tournament was one he will never forget as he won a total of $10,112,001 when playing in it! I’m not sure about you but if I did manage to win a total of $20,445,343 playing poker I am not sure if I would retire from the game there and then rather than continue playing! However, you are going to see Bryn Kenney who has accumulated that amount of poker tournament winnings playing in plenty of other poker tournaments moving forward, and those winnings have earned him the spot of the ninth top poker player in the world. As for just which poker tournament he will probably remember the most, it would probably be the one in which he did amass the most in poker winnings, that being the 2017 Poker Stars Championship Monte Carlo poker tournament event the €100,000 No-Limit Hold’em Eight Max tournament where he walked off with a total of $1,944,302 in prize money! It is Steve O’Dwyer who is the tenth top poke player in the world when you take his accumulated poker tournament winnings into account and tally them all up, and he has to date won a total of $20,286,465 in winnings, a figure that I am more than convinced however is going to continue to grow. Steve O’Dwyer does have his very own unique poker tournament playing strategy, and if you do ever get the chance of watching him play, then I am more than confident that you will learn a lot from him. As for just which poker tournament helped to catapult him onto this listing of the top ten poker players in the world, that was a tournament he entered back in 2015. That tournament was part of the EPT Season XI – PCA event and the one single tournament that saw him having a huge pay day was the $100,000 No-Limit Hold’em Eight Max event, and thanks to his unique playing style and thanks to the way that he managed to play that day he walked off with a total of some $1,872,580 in winnings!